graduated from Irkutsk state pedagogical institute of foreign languages (1984). 2003-2014 – a member of Russian Association for Film and Media Education http://eduof.ru/mediaeducation. 2011-2013 – the Chief Editor of scientific pedagogical journal of Eastern Siberia “Magister Dixit” https://elibrary.ru/title_about.asp?id=32768. 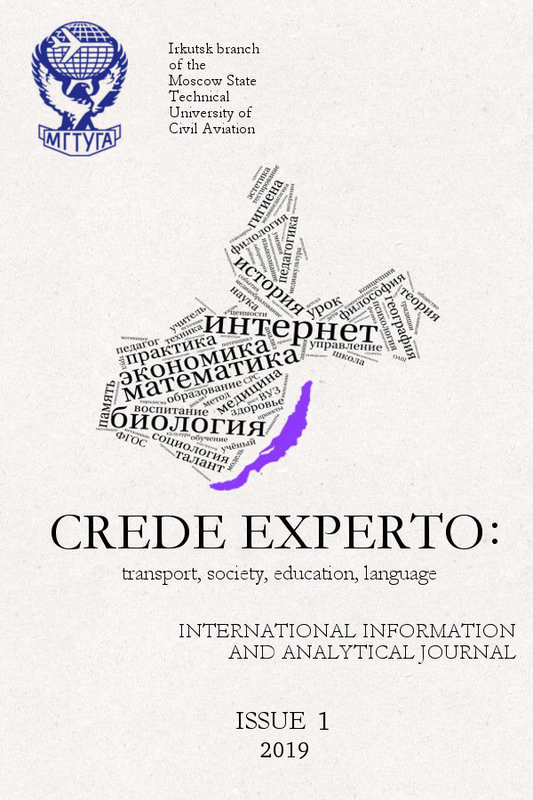 2014-present – the Chief Editor of International informational and analytical journal «Crede Experto: transport, society, education, language» (IIAJ «Crede Experto») http://ce.if-mstuca.ru/. 2011- 2015 – a certified expert of Federal Education and Science Supervision Agency. As a student she was engaged in the scientific research in workshop “Problems of moral education in the system of foreign language classes and extra-curricular activities” at Irkutsk laboratory of moral education problems, Research Institute of common problems of upbringing, Academy of pedagogical science, USSR. She published over 170 scientific papers on problems of education and media pedagogy. According to eLIBRARY.RU (an Internet source) the total citation count is 530; the total number of publications is 145; Hirsch index is 11.
cooperated with the Chair of Foreign Languages, gymnasium №44, Irkutsk, on problem “Contemporary pressing issues of educational process and their implementation in thesis researches”. Currently, is employed by Moscow state technical university of civil aviation, Irkutsk branch. “Developing media competence of teachers-to-be in the system of continuous pedagogical education”. “Media educational space of high school as a factor to develop media competence of the student’s personality”. “Media educational space of high school as a tool to provide individual educational trajectories of students in the context of transition to Governmental Education Standards of new generation”. “Developing media competent secondary language personality in the course of teaching a foreign language”. “Developing civic consciousness of pedagogical process participants by media education”. “Gender aspect and age conditionality of the relations to media”, etc. 1999-2013 – the Head of the workshop “Issues of media education in school and university pedagogy” (the workshop functioned within the framework of East Siberian Center of development of pedagogical science and education). Since 1999 – the Head of the Center for science and education “Issues of media education in school and university pedagogy” in Irkutsk region (about this ref. the articles: Fedorov, A.V. Centers for science and education in Ural and Siberia in the area of media pedagogy: comparative analysis [Text] / A.V. Fedorov // Distancionnoe i virtual’noe obuchenie. – 2010. – № 8. – C.15-42. ; Fedorov, A.V. Criteria and estimators of efficiency of the centers for science and education in the area of media pedagogy: analysis [Text] / A.V. Fedorov // Distancionnoe i virtual’noe obuchenie. – 2010. – № 11. – С.4-16. The articles are in the open electronic full-text library “Media education and media culture” http://mediaeducation.ucoz.ru/forum/2-21-1 and on the platform of national electronic library http://elibrary.ru/). Khlyzova N.Yu. Pedagogical conditions to develop media competence of the secondary language personality: author’s thesis for candidate of pedagogical sciences. Moscow, 2011. 22 p.
Grigorieva I.V. Informational and educational space of high school as a factor to develop media competence of a teacher-to-be: author’s thesis for candidate of pedagogical sciences. Moscow, 2014. 25 p.
She participates actively in international and all-Russian conferences at various levels.